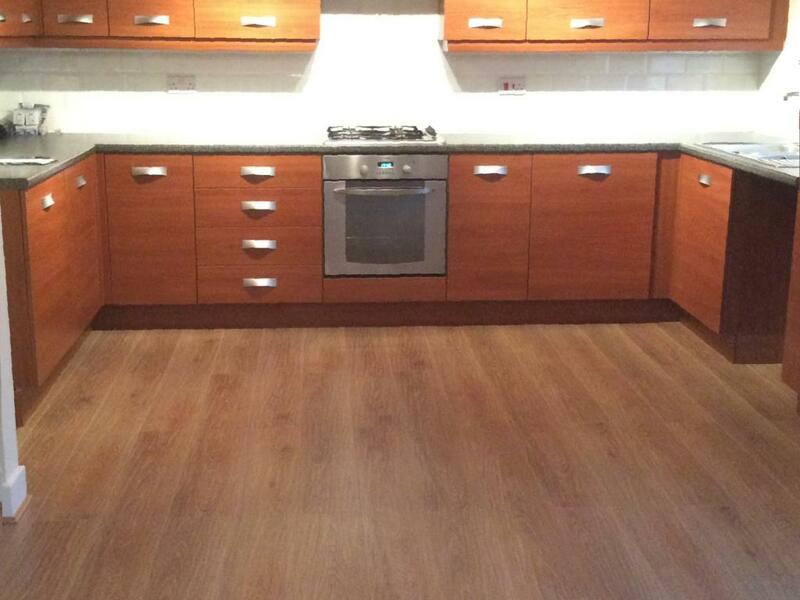 Laminate flooring installed to a kitchen and living area in Leyland, near PrestonKSW Services offer professional laminate flooring fitting as part of our Joinery Services. Laminate flooring is a good hard-wearing wipe clean solution and a favourite for a DIY project. The larger the area to cover though, the easier it is to end up with warping or spacing, hence the reason for employing professionals, rather than doing it yourself. We are experienced fitters, meaning awkward shaped rooms are no problem and there will be no warping or spacing. Flooring is laid in the property to acclimatise and suitable gaps are left round the edges to allow for seasonal expansion and contraction. These are hidden with matching beading attached to your skirting board. Looking for laminate flooring fitters for your shop, nursery, office or other commerical premises? Why not contact us for a competitive price? References can be provided on request and we carry full public liability and professional indemnity insurance cover. If required, we can provide our Laminate Flooring services as part of a full property refurbishment, whether it be for a rental property, preparing a house for sale or following a bereavement. For examples of our Laminate Flooring work, please take a look at our Photo Gallery page. Based in Penwortham, we offer Laminate Flooring services throughout the Preston area including Penwortham, Leyland, Chorley, Blackburn, Garstang, Bamber Bridge, Fulwood, Walton-le-Dale, Lea, Ingol, Ashton-on-Ribble, Longridge and Lostock Hall.